Pullover style pajama jacket has banded front neckline, long sleeves, front hip pockets and tie belt. Trousers have waistband with tie string and front fly. Men's Size Small, Chest 34-36. 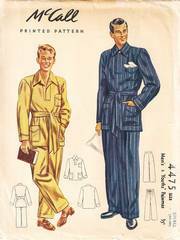 This is an original vintage sewing pattern, copyright 1941. The pattern pieces are uncut and still in factory folds. The envelope is aged and fragile but complete and still has the flap attached. The edges have been carefully mended/reinforced with archival tissue tape.